When you want to wear all your autumn/winter knits but the weather isn't cooperating, try wearing them with shorts! With our extremely warm start to autumn I wore this outfit combination a few times to wear some cosier pieces without overheating. The perfect opportunity to wear one of my recently unboxed winter knits. While I keep my summer pieces in my wardrobe year round, I have no need for winter knits and scarves and leather jackets most of the year here in Brisbane, so I box them away. Unboxing them when the weather changes is always so fun, even if it does lead to the inevitable 'I have no space in my wardrobe' and 'why do I have so many clothes?!' freak outs when I try find a spot in my wardrobe for it all. It was a cooler morning and we were spending the day playing outside in the shade at playgroup, so I thought this knit would work well with shorts and ankle boots. It was the perfect weather and outfit and I loved wearing this. With the embellishment on the knit I wasn't sure at first if it would work with the printed shorts, but with a lot of white in the print I thought they tied together nicely when I put them on. I really enjoyed wearing this outfit. Last worn: embellished jumper, printed shorts, black ankle boots, Balenciaga tempete day bag. Other ways to wear: embellished jumper and jeans, printed shorts and embroidered blouse, black ankle boots worn 30 ways, Balenciaga tempete day bag and swing dress. Perfect for pregnancy: black ankle boots in second trimester, Balenciaga tempete day bag in third trimester. Since I enjoyed the outfit above so much, I thought I'd try the formula again. I should have checked the weather before I did so, it was a warmer than usual day and I did regret the knit at a few points. Fun day though! We had our local ABA mother's group in the morning, a little shopping in the afternoon and then I got changed and we headed down the coast for dinner with my family. It's the first time I've worn this necklace, an item sold as a fundraiser for ABA. 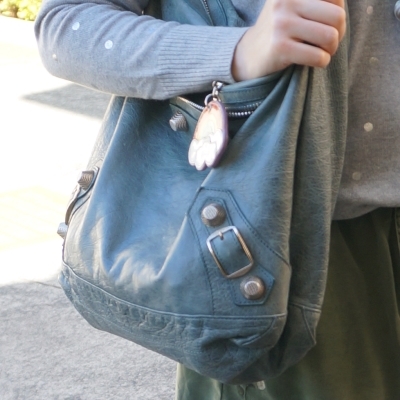 With the silver beads and print I thought it would match nicely with my silver foil knit and tempete Balenciaga day bag. Last time I wore a normal necklace to the ABA I regretted the decision - spending my stay at home mum days at playgroup or mother's group means baby-friendly necklaces are the best choice! While my boys are past the teething stage, my friend's baby adored chewing on this necklace as I held him for a moment while my friend was busy with her other son. I think I'll be wearing baby friendly necklaces for a while, even though my boys are toddlers now! 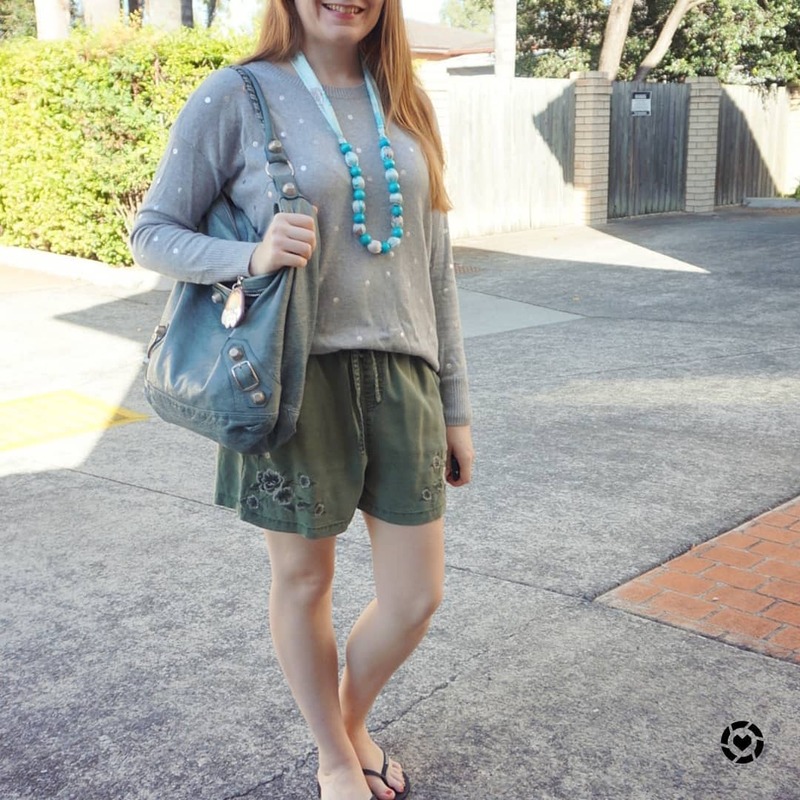 I did think that the necklace, knit and bag all worked well together but I'm not too sure about the olive shorts. 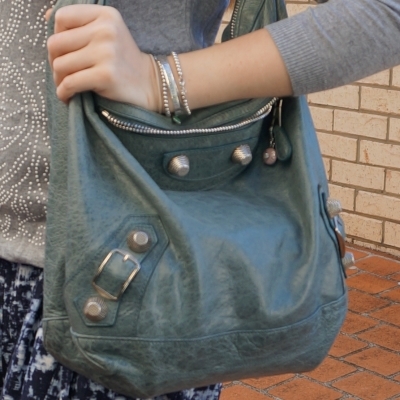 I usually find green a tricky colour to wear, I think a neutral bag might have been better with this outfit. Last worn: polka dot foil knit, olive embroidered shorts, Havaianas, Balenciaga tempete day bag (above). Other ways to wear: polka dot foil knit and denim, olive embroidered shorts with mustard, Balenciaga tempete day bag and maxi dress. Perfect for pregnancy: Balenciaga tempete day bag in second trimester. Thin knit jumpers like these are great pieces that you can wear by themselves in spring and autumn or layered up with things over or under them in winter. If the weather isn't the perfect coldness, you can still wear them with shorts as I have above. Definitely pieces you can get a lot of wear from outside of winter. Linking up with Style On The Daily, Oh Hey Girl, Fashion Frenzy, Fashion Files, Fun Fashion, Style Wise, Weekend Wear, Fabulous Friday. Thanks Sasha :) I'm glad you liked it with both outfits, as I wasn't sure about the second one. Beautiful knits! I've always enjoyed pulling out my winter items when it turns cold! You always show great options of outfits, Mica!! Of course the weather doesn't always cooperate with what we put together..ha ha!! Yes, the weather can be frustrating sometimes, haha! The two looks! I love how flowy the shorts are. Love the detailing on your sweater in the first outfit. I keep my clothes out all year around. Do to I never know how the weather is going to act. I'm lucky that once the winter weather goes away we definitely won't need our knits - it gets humid and warm here in summer! Ooh I love the way those boots look with the shorts - very fall-chic! I love the look of shorts with sweaters for days that are a little cool but not cold. I love both of those gray sweaters too, the detailing makes them both so fun and unique! It's good to take advantage of those days - shorts weather is definitely behind us now! I hate switching out my closet, especially winter to summer, because I have way more summer things and all my knits stay in a dresser, so I always have that "why do I have all these clothes" freak out! It's always bad because this time of year I haven't gotten out the summer stuff, but I've been happily summer shopping. If only there was more closet space. haha yes, my problems with clothes would be resolved by more wardrobe space! I don't pack away my summer pieces as I can layer most of them for winter, but it makes it harder to find spots for all my winter things when my wardrobe is already full! Oh I love both pairs of these soft shorts! I am on the look out for a couple of pairs in that style for summer. They look cute and comfortable, which is always a winner in my book! I love wearing this outfit formula during the summer here because the mornings can be so much cooler. A sweater helps me stay warm enough while the shorts keep me cool enough in the afternoon. I like your colorful necklaces with these looks though. I need to add in some fun accessories when I try this next. I hope you enjoy the rest of your week! These are so cute! I love both of shorts, but I think I like the second pair better. The little floral on the side is really sweet! The embroidery is why I bought those shorts, haha! Such a cute touch! The rate I'm accumulating grey knits I think I agree with you, haha! They are perfect for layering with! I like the contrast of a sweater with a traditionally summery piece, like shorts (or a short skirt). These are both very cute outfits, Mica! Thanks Sheila! It's a good outfit idea for the days where it's not too cold yet. I love the subtle print on those two tops! You look great! haha thanks, it is a great bag! I feel the same when autumn starts. Is warm and cold at the same time. And you had a genial idea. Knits with shorts. Thats amazing we could mixed diferent season articles and being very stylish. Yes it's fun to mix the season pieces together when it's not too cold! The color of that bag is gorgeous! Love both grey sweaters, Mica! 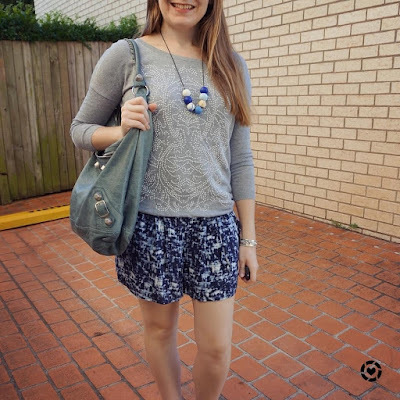 I am a huge fan of wearing sweaters with shorts too, I think it's a great way to dress for unpredictable weather. It seems that you do have a good formula for your outfits and style. I really like both looks but the second look is definitely more casual and relaxed. Hope you have a great week. We're off to a wine tasting with friends. I just love both of these grey tops. I just bought a foil printed top from the outlets this Monday and I love it! I just love booties paired with shorts! Thats a cool idea to wear knits and shorts. Both outfits are lovely but I like the second shorts best! Love all the details too! I really love the grey embellished knit Mica, it's so pretty! Ouch those earrings would be painful! I tend to stick to my studs most of the time because it can be sore when they pull on them! It's better having fun necklaces to distract them from my ears, ha! love the combo of shorts and sweaters...you look adorable!!! Oooh I love those shorts in the first look! How cute are they? !